I felt atrocious on Monday. I ended up taking the day off from working out and chose to veg out on the couch for most of the day. I had some soup and things (including a broth-based spinach soup I might have to recreate the next time I’m sick! ), but basically not a lot of noteworthy things went into my system. However, today I hope to change that. First, on Sunday I had some good eats. 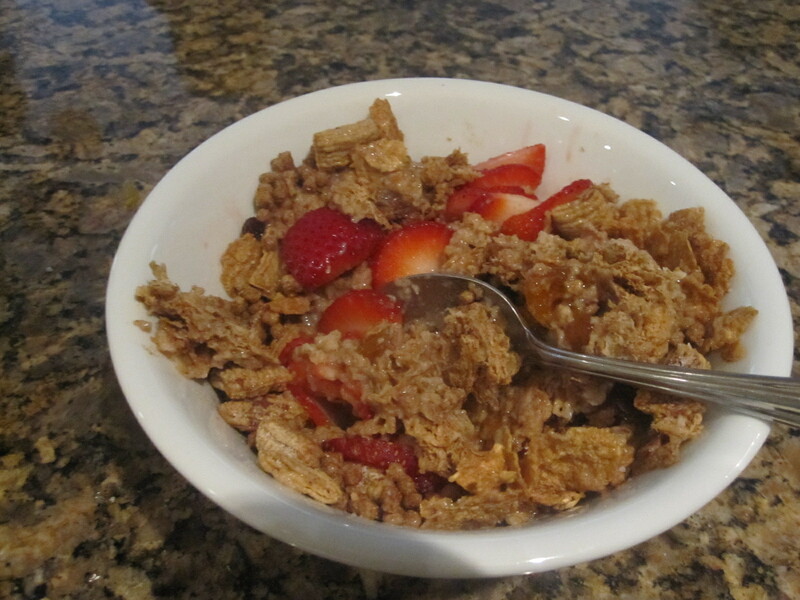 Big old bowl of raisin bran, bran buds, almond milk, strawberries, and a bit of PB and jelly. 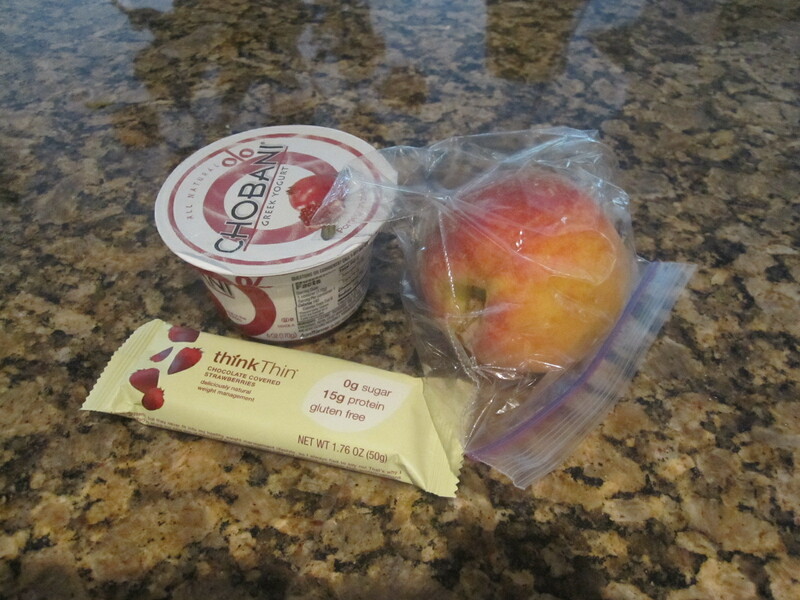 Work snacks: Chobani, ThinkThin bar (that tasted like the worst depths of hell, I hate fake sugars but the flavor seemed like it’d be good) and a big peach, along with two Medjool dates. Monday’s breakfast: Big Pink Lady, flaxseed toast, Smart Balance, Almond Butter, Greek yogurt. Now, on to the actually great food! A few weeks ago I had purchased a tin of frozen cooked lobster meat. 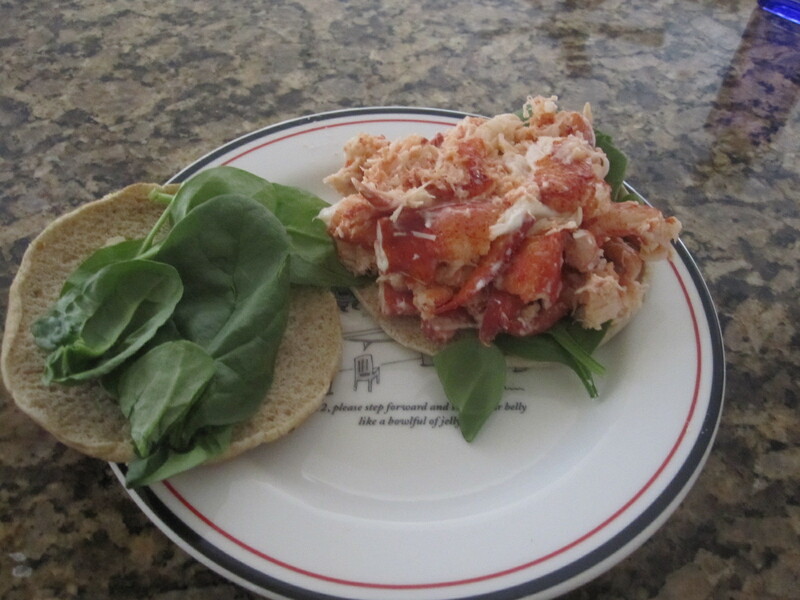 On Monday, I pulled it out and thawed it, and yesterday after my run I used about half of it together with a few dollops of light mayo to make a lobster salad, something we serve down at the casino that always makes me starved when I see someone eat it. I slapped it on a multigrain sandwich thin (buttered with Smart Balance). 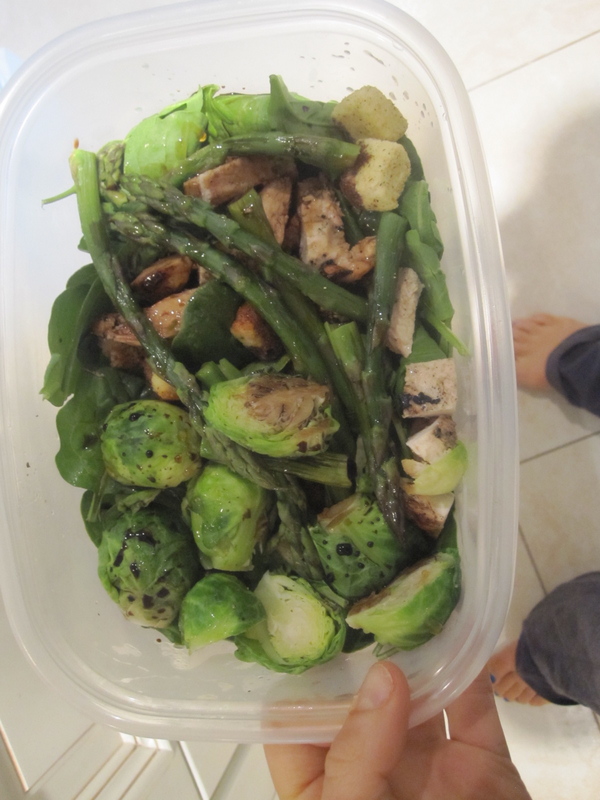 You can bet I will be eating this tonight, along with some oven-baked fries. 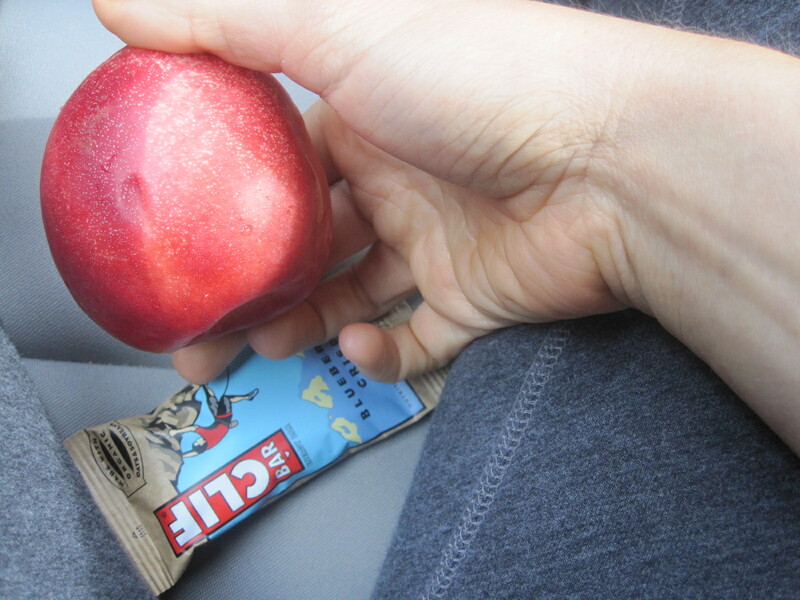 Before hot yoga, I had a Blueberry Crisp Mini Clif Bar and a nectarine. Tonight I had Power Chill yoga, which was a lot different than most power yoga classes. It doesn’t heat up as much as regular Power, and at the end the temperature is cooled way down in order to relax the practice and experience some calming, soothing poses. It was also my first class with this particular instructor. Unlike my regular teachers, who concentrate on vinyasa, this teacher was all about holds and poses, and really making us shake. I was really tired during class, but I worked through it and left class very relaxed. When I got home I had a serving of vegan cookies n’ cream ice cream with strawberries. When I woke up this morning I decided not only would I wait to work out until after work, but have a full bowl of oats before heading in so I’d be full and not feel starved when my little snacks made their way out at noon. 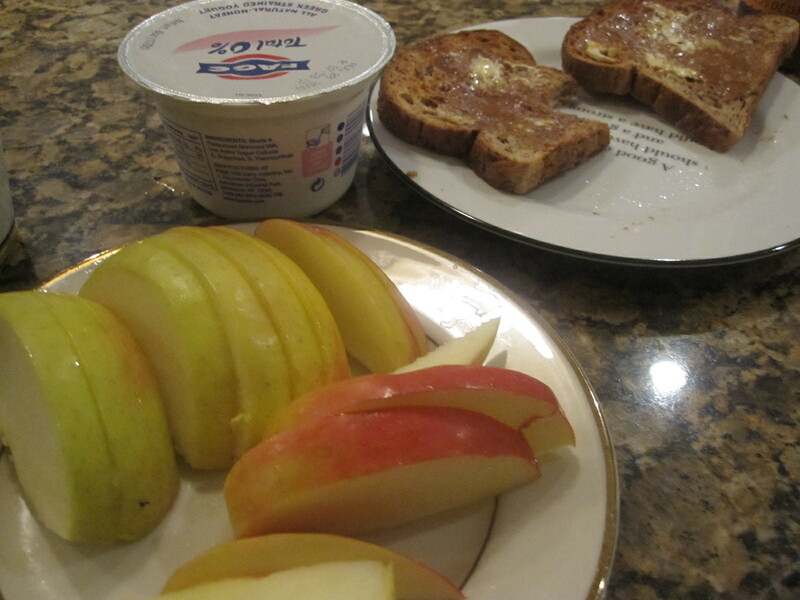 Before I put all of this in the microwave I had a crispy Braeburn apple! 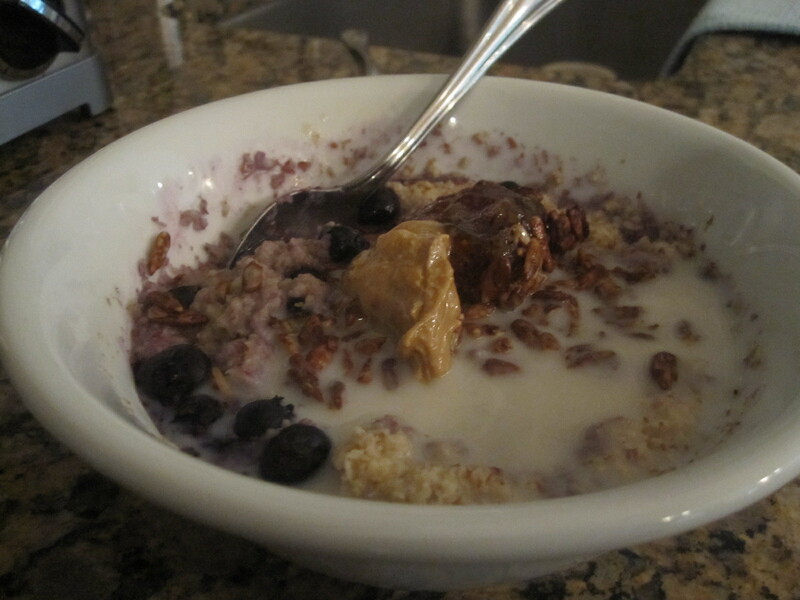 This was one giant bowl of oats, and I can already feel my belly filling! If you’ve never tried cashew butter, I suggest you do so, particularly if you have a love of cashews. I’ve always loved that nut for its creamy texture and the butterized form does not disappoint. This was such a different bowl of oats than what I usually have, and I absolutely loved it! Today for my work lunch (or rather work ‘snacks’) I plan on sampling one of the new Larabars! Can’t wait!